A few weeks ago, I introduced the subject of Blanc du Bois, in general, specifically in Texas. This hybrid grows well in coastal areas due to its resistance to Pierce’s disease. The name translates loosely as “white wood.” After exploring in the kitchen with Haak Blanc du Bois Madeira with great success, I decided to try a lighter style, in the pan and in the glass. 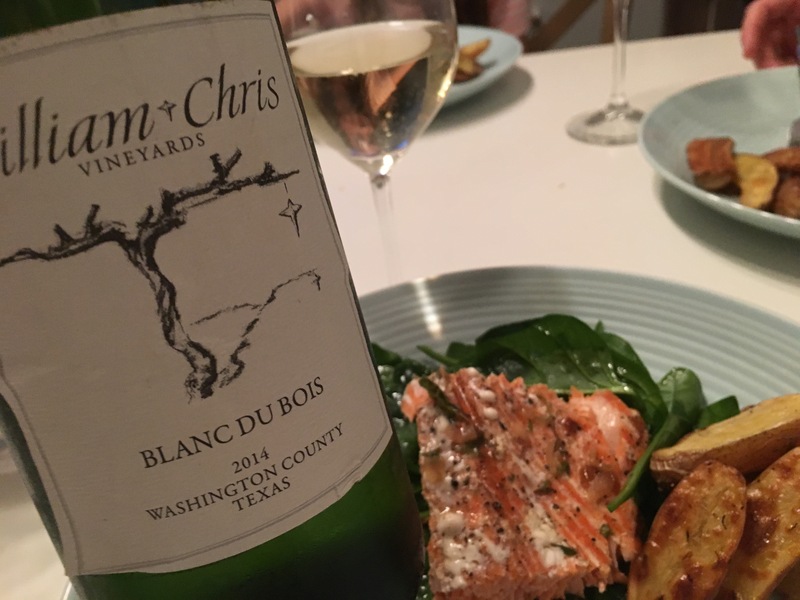 If you’ve been reading for any time, you know that William Chris is one of my favorites in Texas Wine. Their Blanc du Bois is a bit of a chameleon, year to year and in the glass. It is at once bright and citrusy, woodsy and weighted. A unique mouthfeel, it is a fun wine to introduce to others. At the winery in Hye, William Chris makes it as a sparkling, as a component of Mary Ruth, their signature white, and as a single varietal wine. I chose to pair it with salmon and made a buerre blanc with shallot, butter, a bit of wine and a dash of lemon. Served on top of wilted arugula and with roasted fingerlings, it turned a weekday meal into an occasion. While the 2014 is gone, you can find the current 2015 release at the winery or online. This year’s was picked early and was stirred on the lees with long skin contact. So how will it differ? I’d be happy to investigate. In fact, I see a trip west in my very near future. Who wants to meet me? Sounds like a great dinner! !